If you are looking to up your nail game for Spring but don't want to spend money on nail art tools then you have come to the right place. If you don't happen to have any dotting tools but do happen to have a spare bobby pin/hair pin then you are all set for these 5 tutorials! 1. Apply 1 x coat of base coat and leave to dry. Paint 4 x of your nails white and 1 x pink. When dry, apply 1 x more coat of each. 2. Using a dotting tool or hair pin paint pink polkadots on the white nails. I'd suggest painting 3 x dots down the centre and then work out from there to make sure they are equal. 3.Using a small amount of nail glue stick on your Hex bow charm. Once both glue and polkadots are dry you can then paint a top coat and you're done! How simple was that?! 1. Apply 1 x coat of base coat and leave to dry. Paint 4 x nails green and 1 x white, once dry paint 1 x more coat on each. 2. Using the brush in your nail varnish paint small blobs anywhere on your green nails. It doesn't matter that they are messy just make sure they are not too big or close together. 3. Now with a darker green use a hair pin or dotting tool and create small dots around the messy blobs! Don't join all of the little dots up and you can add a few extra in any empty space you have. 4. Now using the first green colour and a dotting tool or hair pin, do what you did to the white blobs with the second green colour. Basically, just create the outside part of the leopard spot! 5. Then using some nail glue add your Hex palm tree nail charm onto the accent nail. 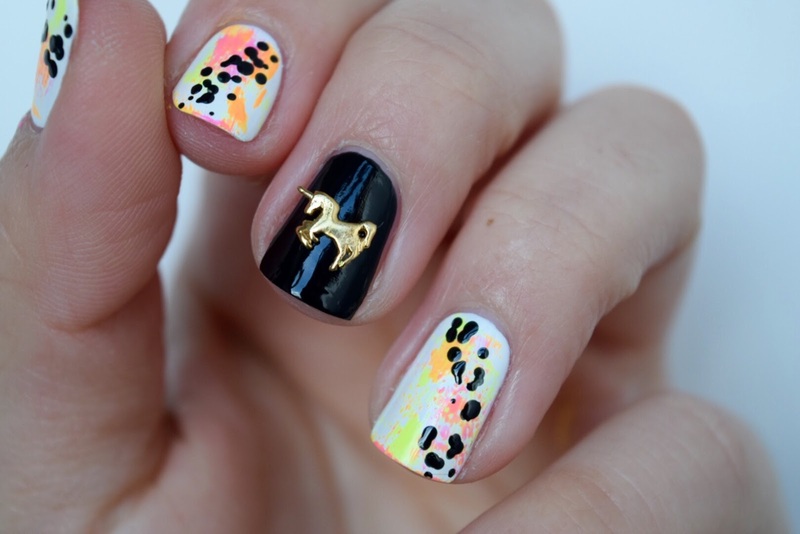 Wait until glue and leopard spots are dry and apply 1 x coat of top coat. 1. Apply 1 x coat of base coat and leave to dry. Next, using a darker pink paint 4 x nails with this and 1 x with a light pink. Leave to dry and apply 1 x more coat of each. 2. This glitter gradient part can be a little bit tricky. You may have seen other tutorials using a sponge and I think this is a must when using a full colour but not always necessary when using glitter. When I take my brush out of the bottle I try to take off as much excess clear varnish as possible. Then I dab the glitter right at the bottom of my nail. I then wipe off the brush on the bottle and carefully spread the glitter up the nail. To really create that gradual look, try to keep the bigger parts of glitter at the base and only spread it half way up the nail. 3. Finally, using nail glue apply a small amount to your Hex flamingo charm and add to your light pink nail. Once dry, apply 1 x coat of top coat to all your nails and you are good to go! 1. Apply 1 x coat of base coat and leave to dry. Then apply white nail varnish to 4 x nails and black nail varnish to 1 x nail. After leaving them for a few minutes to dry, add 1 x more coat of each. 2. Using 3 x neon colours you are going to create a messy, graffiti look! Firstly, take the orange and wipe off any excess paint on the brush into the bottle. Then brush it over the nail a few times. You will end up with a dry brush effect. Once happy with the colour, use the same technique for the yellow and pink. It will look messy and it will get over the ends of your fingers but that is what nail varnish remover is for! 3. After leaving the neon colours to dry you will need your black varnish again. Using your dotting tool or hair pin, apply a small amount of black paint to the end and start creating those leopard spots. I went diagonally across mine but you can choose to do it all over or maybe just on a few nails. 4. Now you can add your magical Hex unicorn charm with a little nail glue. Once everything is fully dry, apply 1 x coat of top coat. I say 'fully dry' for this because black nail varnish can smudge really easy when the top coat is applied. It would be a shame to ruin your nails after all that work! 1. Apply 1 x coat of base coat and leave to dry. 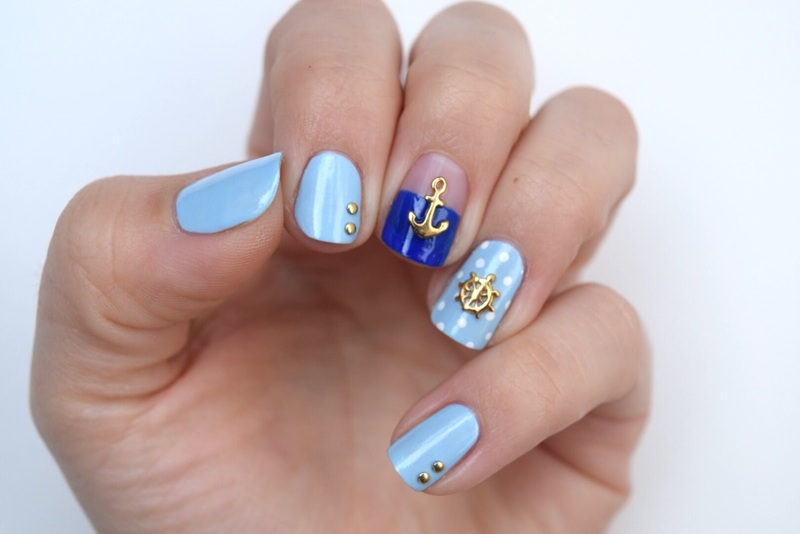 Next, paint 4 x of your nails with a light blue and paint half of one using the navy blue. I never used to get a straight line and I think this time was a bit of a fluke to be honest! If you are finding it difficult then just use some sellotape across your nail but make sure you don't let the navy blue dry whilst the sellotape is still attached, it will peel off with it! 2. Next, using some small gold studs and nail glue apply 2 x to the corner of your nail. I use a small cocktail stick with some blue tac on the end to help pick up studs and charms. 3. Next, using your dotting tool or hair pin grab some white nail varnish and dab a little on the end of your nail tool. To create the polkadots I recommend dotting three down the centre first and then work outwards. 4. 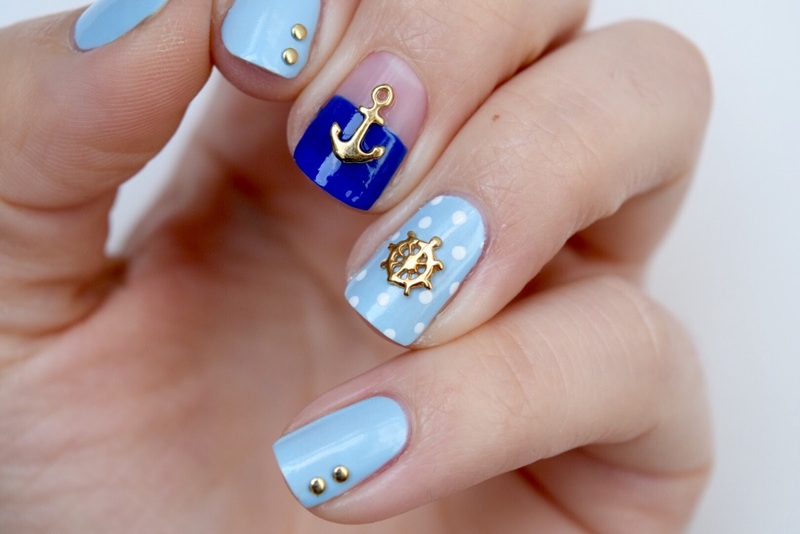 Finally, dab your Hex Anchor and Fishermen's wheel charms in some nail glue and attach carefully to your middle finger (half navy blue) and your ring finger (polkadot) nails. Once fully dry apply 1 x coat of base coat and you are good to go! As you can see these are probably a lot simpler than you first thought and don't take that long either. I'd say the longest you will have to wait is for the paint and glue to dry but if you have some time to spare you can really jazz up your nails and you will be happily surprised with the amount of compliments you get! This post isn't sponsored by Hex Nails and I bought the charms using my own money too! I did get sent a few extra ones though, the girls are so lovely there! I have bought many nail charms from Hex before and have never been disappointed. They have a HUGE range of charms and stencils from animals, to words to love hearts! Thank-you for reading, I hope that this post has been helpful!